This is a close up view. The installation is 28' wide and 15' tall. Each color area of the bell curve represents one stanine in the bell curve results of standardized tests. Students that take standardized tests are evaluated using a bell curve to manage the date. The tests are nationally normed so that most of the students fit within the center three stanines. Students that deviate from the norm fit into the outer stanines indicating both higher and lower performance. In my sculpture, this is represented by the three stanines on either end using regular #2 pencils with a colored exterior. 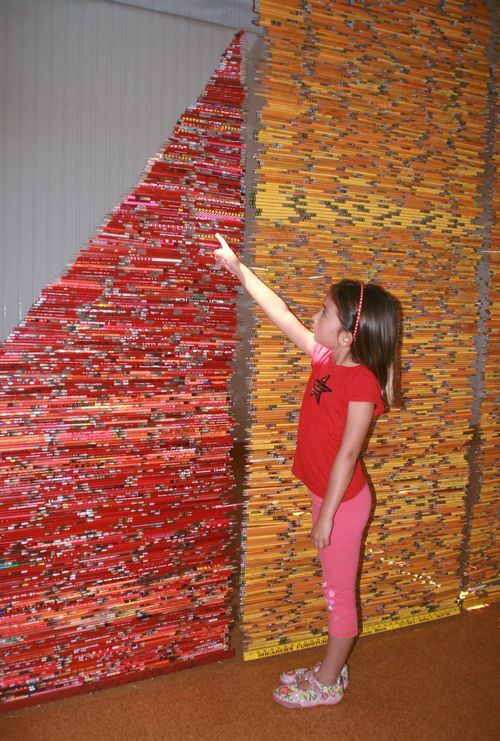 The stanine of red pencils is an example. The social commentary about the impact of standardized testing on our educational system is enormous. There is huge financial investment resulting in a tremendous impact on the students, teachers, school districts, and the content of the curriculum. In addition, standardized tests only evaluate a small spectrum of student ability excluding the arts, athletic and theatrical performance, creativity, and more.